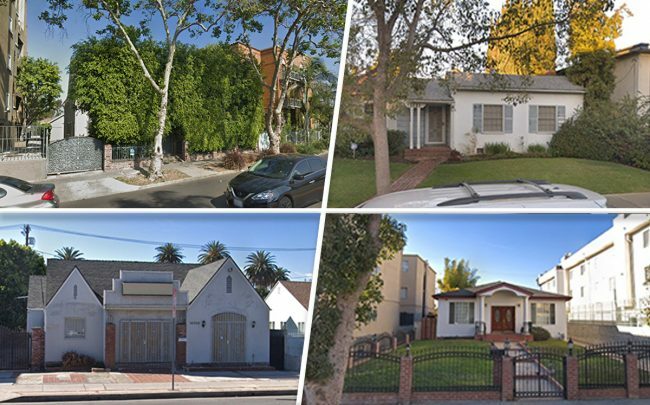 All four of the under 50-unit apartment projects proposed in Los Angeles seek to take advantage of the city’s Transit Oriented Communities program. The popular program provides incentives to developers who include affordable units near transit stations. If approved, the projects would add a total of 67 units of housing. Three of them would be located relatively near each other in Mid-City, Hancock Park and Mid-Wilshire. The fourth would be in Van Nuys. Santa Monica-based entity 643 Hancock LLC filed plans for this six-story project near the corner of Vine Street and Melrose Avenue, with plans to set aside two units as affordable. The project site is about 6,500 square feet and is wedged between two apartment buildings. The new development would replace a duplex there. The developer purchased the property in August 2018 for $2.1 million, according to property records. A five-story apartment building would replace a single-family home near the corner of San Vincente Avenue, where nearby bus stops make this property eligible for Tier 3 TOC benefits, the second-highest level in the program. A West Hollywood entity tied to lawyer, Ardeshir Sarbaz, filed for the plans. The company bought the property for $1.7 million in May 2018. Two units would be set aside for affordable renters. A few blocks from the South Spaulding Avenue project, a 14-unit building is planned to replace a single-family home. The project site is a block and a half from Pico Boulevard and near its intersection with Fairfax Avenue, where there are numerous bus stops. Like the South Spaulding Avenue proposal, it’s eligible for Tier 3 TOC benefits. The owners are Arash Rashidi and Mehran Shaliehsaboo, who purchased the property at the end of 2017 for $1.4 million. The one project filed in the San Fernando Valley is this four-story complex in Van Nuys. It would replace a single-family home. It would include underground parking. The company that owns the building, Amigo Casa LLC, is run by Jonathan Azal. The company bought the roughly 6,800-square-foot property in July 2018 for $650,000.